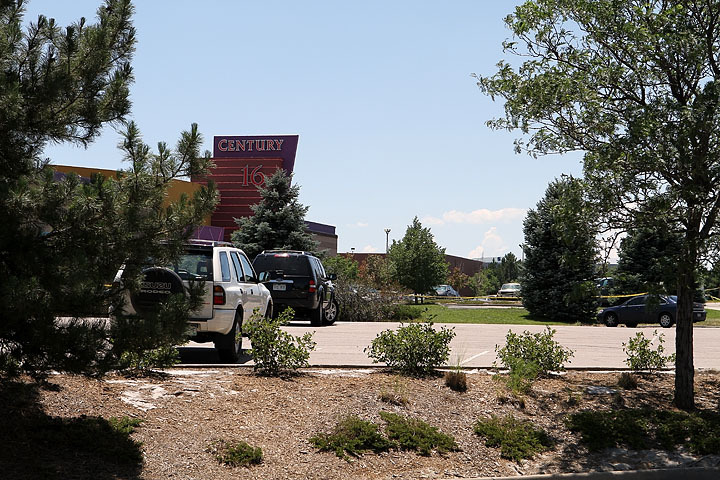 I woke up this morning in Arvada to the news that a gunman had opened fire at a Century 16 movie theater over night during the premier showing of the final Batman movie, The Dark Knight Rises. We had planned on going to Boulder today, and I was going to do some stock photo stuff along the way, but due to a sick dog, we decided not to. I thought about heading over to Aurora (about a half hour away in good traffic) but I figured by the time I got there, nothing would be going on. So, out the door I ran, I had my Canon 7D out already and thinking of the photos I needed, decided that the 24-70 lens I had on it, and I hopped into the car, programmed the GPS and took off. When I got to Aurora, it was 103 degrees outside. 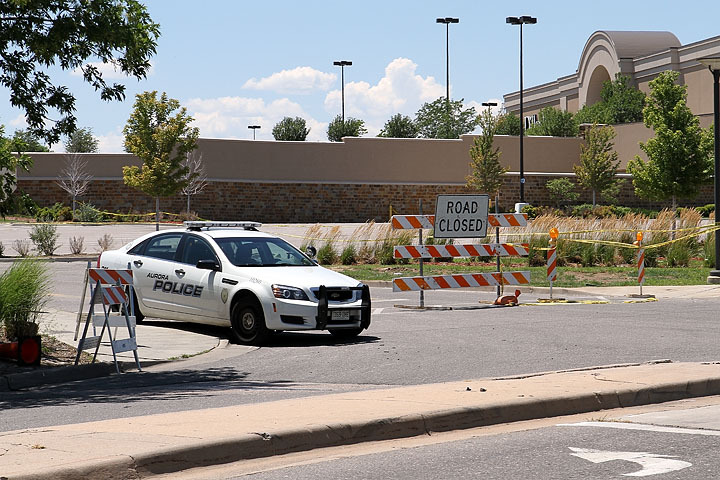 I had to park a couple blocks from the mall because Police had shut down the entire shopping center and almost all the surrounding roads. I walked up to a police barricade and told the officer I was shooting for ZumaPress, had my photo assignment editor’s email open on my iPhone, and worked my way past the police to the media area. We were a good 500 plus yards away from the theater (which could have easily been the Anchorage, AK Century 16 theater the way it was laid out), and I started looking for angles that I could shoot. Should have brought my 120-300mm lens, or at least my 70-200….but no. I tried talking an officer into letting me get closer, but it was no go. He was pretty cool though. 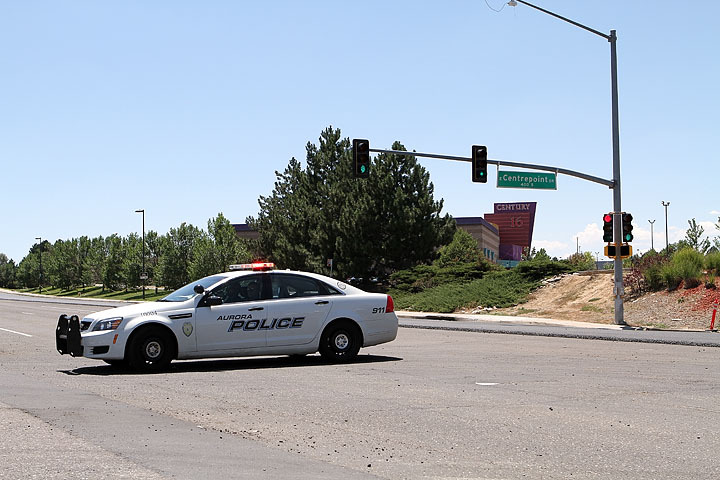 Anyway, I shot about 60 photos, trying to get Century 16, with police cars or police tape in the photos, but as for anything exciting, it was pretty dead. No action going on, and media was camped out everywhere. So I headed home, stopped at Sonic since I missed lunch and edited the photos for delivery to Zuma while I had a SuperSonic burger and a Cherry Limeade. This entry was posted on Friday, July 20th, 2012 at 1:30 pm	and is filed under Media. You can follow any responses to this entry through the RSS 2.0 feed.